I’m pretty tired…because I’ve been a crafting/sewing maniac lately. Let’s refer, one more time, back to my Living Room Plans. As you can see, I designed it with two green wreaths hanging on either side of my Monogram art. Well the Monogram art hasn’t quite happened yet–(hopefully soon)–but I’ve been keeping my eyes peeled for wreaths that I like. And all pre-made wreaths are HIDEOUS. No offense to craft stores, but the cheapie pre-mades are made of the cheapest looking faux florals and I hate them. 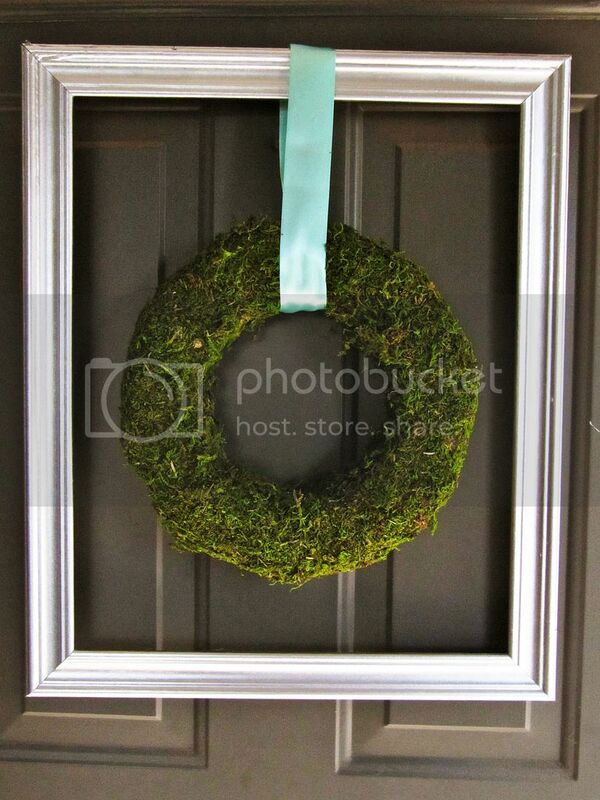 So I had an idea…Make a wreath out of moss! That would give me the green, real look I wanted without the maintenance. Hopefully these will last forever. Moss: Instant Green with the mesh backing: Make sure it has the mesh backing or this project will be a lot harder/messier than it needs to be! 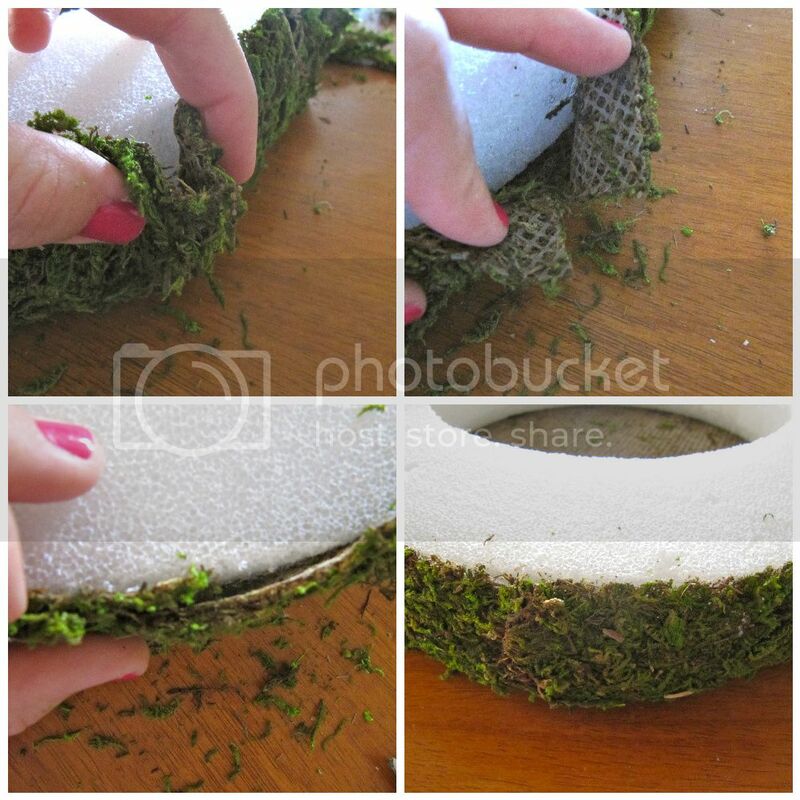 To start: Lay your foam form over top of the mesh part of the moss. 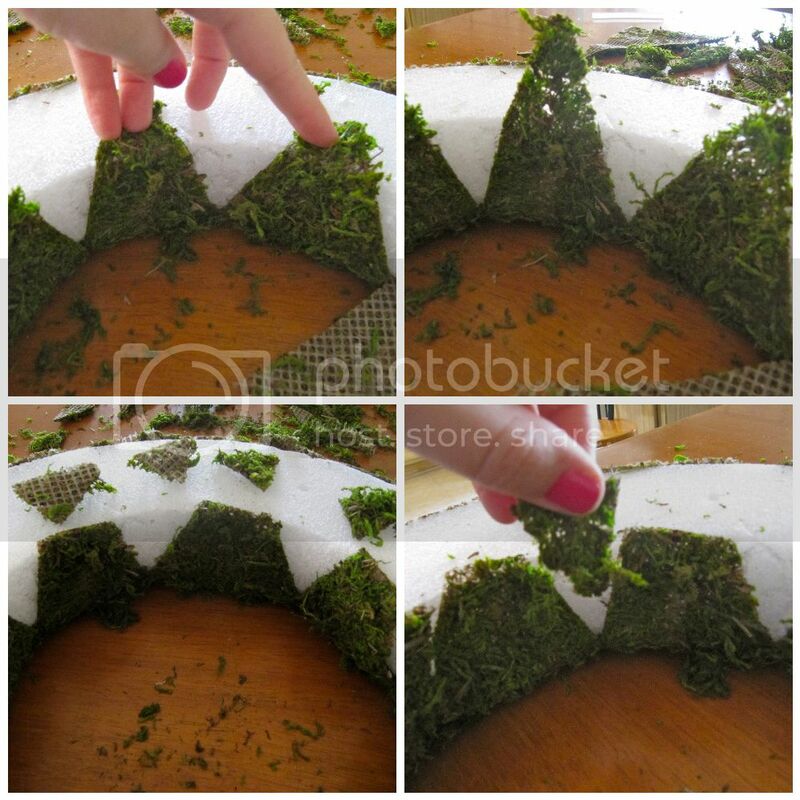 Then, using the wreath’s height as a guide, cut around the wreath, (regular scissors work great) to a rough circle shape You want the moss to cover the sides of the wreath form. After you cut the circle, hot glue each side up. You’ll have to hold it there for a second, it takes longer to bond. I think a low-temp glue gun would probably work better but I don’t have one. You will have a bunch of puckers after gluing up the largest sides. To get these to lie flat, cut down the middle of the pucker. Then overlap the pieces and trim away the excess bulk. Then just add some more glue to hold in place. 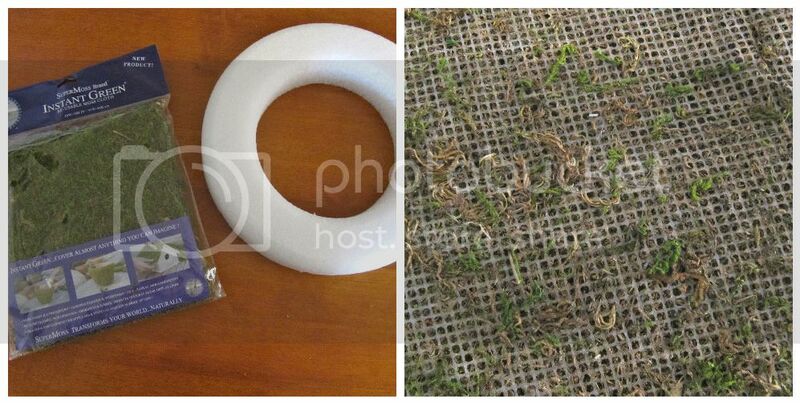 After you’ve done all of these, trim the edges so you have a nice flat wreath on the back. 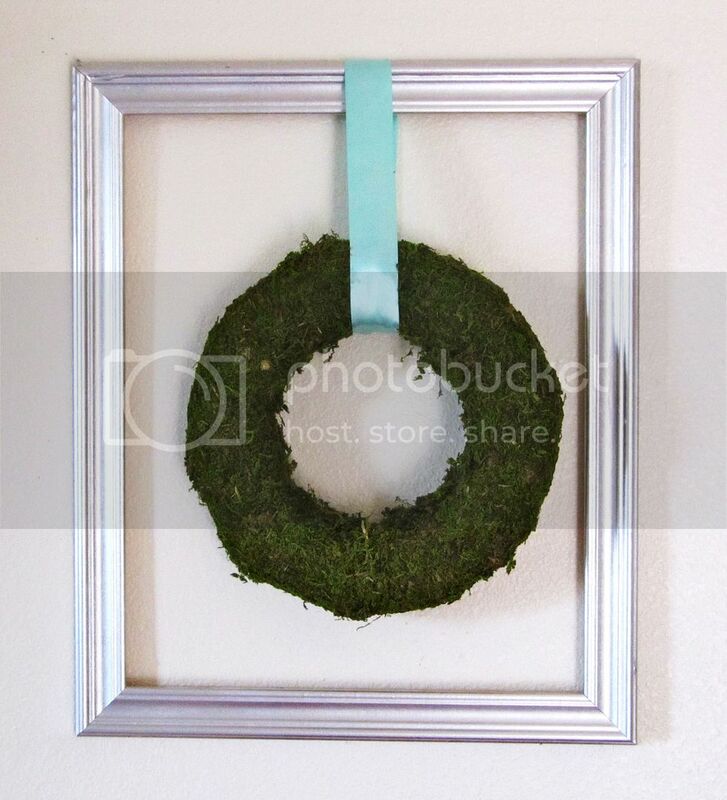 Flip over your wreath to make sure it looks the way you want it to. Then, using your scissors, cut into the middle of the wreath. Cut 7 slits in a pie format. Start gluing the pie slices up, holding the tips down so you don’t burn yourself. But don’t glue the tips down to the backside of the wreath! Cut them off. Then you can turn them upside down and glue them in the leftover triangle-shaped gaps. Genius, right? I tied on some aqua satin ribbon to a thrifted silver spray-painted frame. Doesn’t it look amazing on a door?? Perfect for spring or St. Patty’s Day. Do you love the green?! Happy St. Patty’s Day (soon)! I love it! 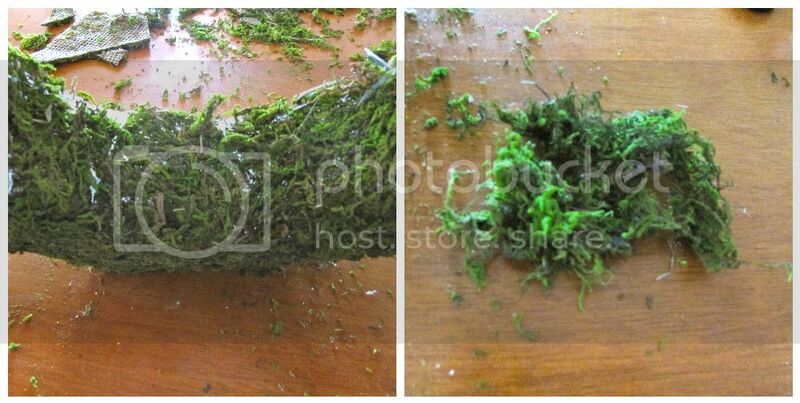 I hope it's not real moss though, I've done crafts with it before and it starts to stink! I love this wreath. Great tutorial. I am featuring it this afternoon! What a beautiful wreath. Simple, striking and elegant. Everything I love! I heart things covered in moss! Your wreath looks fab. This is such a lovely project! I love moss, I have a small moss garden outside my bedroom patio and it makes me smile evert time I look at it.